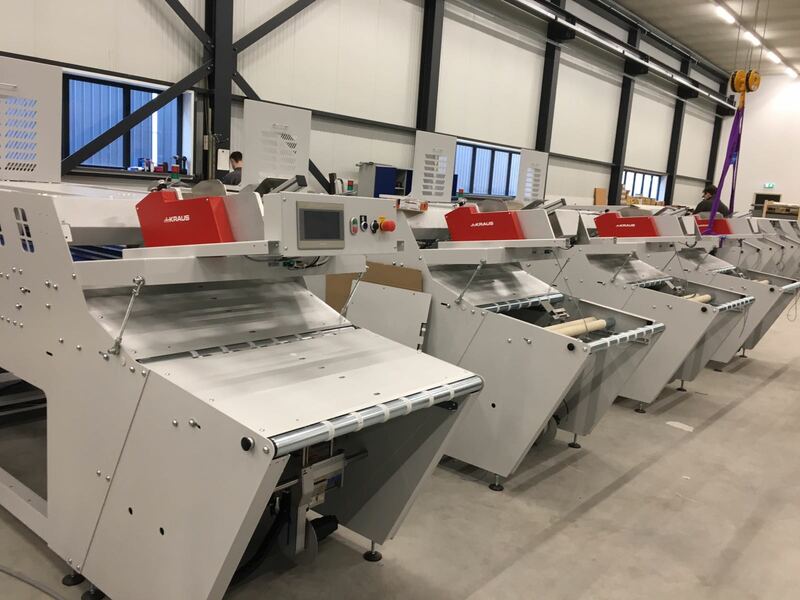 The T-APPAREL, is a highly efficient textile folding machine, creating the highest folding accuracies in its class and processing speeds over 1,000/ hr. The T-Apparel investment starts becoming feasible at an entry level of approx. 350 folds/ hr. contact us to find our if we can fold your item! The high accuracy and folding flexibility is due to the programming options available, allowing to precisely influence each individual folding step. This is unique in this industry! You need to touch the screen no more than two times and you can switch from a small cotton “T” to a large and heavy Hoodie. For this change, no mechanical modifications are necessary! – We call it the “two-second-change”. The lateral fold is done by air and the amount of air you program will influence how the item will fold. While typically approx. 1/3 on the right and 1/3 on the left are folded, you can bypass either left or right or even both of those folds, allowing for further customization in the lateral fold. Note: For very large items, we offer a larger T-Apparel! The lateral fold will also determine the final width of the item. This too can be programmed when setting up the machine. This unique option allows you to perfectly control the outcome when using fully automatic bagging solutions; or if you need to fit the items perfectly in a box to safe space. The first cross fold is carried out by the means of a belt system. The items are “sandwiched” between two belts and 100% controlled during this process. The programming options allow to influence how large the first fold needs to be. This implies you can always get the perfect “french fold”; or for small items, you could decide to have it fold 50%, as an example. The First cross fold can be bypassed. The second cross fold is basically a replication of the first cross fold; another belt system will fold it based on the program parameters. The Second Cross Fold can be bypassed. The T-APPAREL is provided with a “quality-stop” feature. With this feature, the item will make an additional stop for quality-correction, before the actual folds are made. This feature is very helpful for very long and difficult to feed or complicated apparels. The T-Apparel allows to exit in the linear direction (Linear Exit) or underneath, which eventually will be pushed out to the side (Side Exit). Why or when to choose the linear exit? When processing dry-fit material or polyester shirts, you should choose the linear exit. Due to “sandwiching” the item between belts during the first and second cross fold, the item will remain 100% under control. This is the reason why dry-fit can be processed with our machines as opposed to some others. However, the exit must be linear. The reason is, when exiting underneath the machine the item would fall on the conveyor and this fall would be enough, to distort the fold. When multiple bagging, labeling or stacking solutions are required, the choice of two or potentially three exits come in very handy. This too is unique in the industry! Why or when to choose the side exit direction? When choosing the side exit, the item will be conducted back into the machine, after passing the second cross fold. Depending on the choice of “First Conveyor”, “Second Conveyor” or “Third Conveyor”, the item will travel more or less inside the machine. Two flaps will open and the item will fall on the desired Conveyor. Some customers prefer stacking options. This can only be done with the side exit. Other customers prefer the additional flexibility as discussed above, in the topic “Why or when to choose the linear ext?”. By the nature of the textile, some items can be processed faster than others, but when it comes to e.g. T-Shirts, it largely depends on the operator. The variable speed motors allow to increase the overall speed of the machine to reflect the speed of the operator. That is why we can say, “The T-Apparel” is one of the fastest in its class. Highest output in its class, without compromising the quality! The T-Apparel can be synchronized with a second T-Apparel. This feature allows to fold & bag two machines with one bagger. This requires only two people. This is yet another unique feature in the industry! One Bagger for two Folding machines. This yet again increases your ROI. Since the T-Apparel allows to work with multiple exits, this allows for a manifold of custumizations! E.g. This great feature helps the supervisor to keep a “simple eye” on the production output. If green light, everything is ok, if flashing, the operator is slightly under the production, if red, this means the machine is not in production. For companies working on “pay-per-piece”, this feature helps the operator to monitor if the quote is reached, or if the production needs to be increased. The T-Apparel is now able to also automatically insert cardboards. This feature cannot be added to the machine later on and needs to be ordered with the machine. Below, the red device on the machine is the cardboard inserter. The T-Apparel is now able to automatically apply size labelers. Multiple size labelers are possible, as well. They are mounted underneath the Feed-In area. Besides the Size Labeling option, the T-Apparel can be equipped with various other labeling options. Those can be mounted either directly onto the conveyor, or they may be a stand-alone solution. Multiple stacking stations with optional automatic size-sorting. Production lights, indicating if the target folds/ hr are currently met.